Take A Second Look At Some Underused Annuals! In garden centers jam packed with sun loving petunias, geraniums, calibrachoas, verbenas, and lobelias, shade loving impatiens and fuchsias, and sun to partial shade geraniums and coleus, I like to search out the underused and under-loved annuals. The annuals that seem to be getting harder to find. Old favorites like these annual phlox planted in a container with sweet alyssum in my garden last summer. The compact annual is covered with small clustered blossoms all summer long. 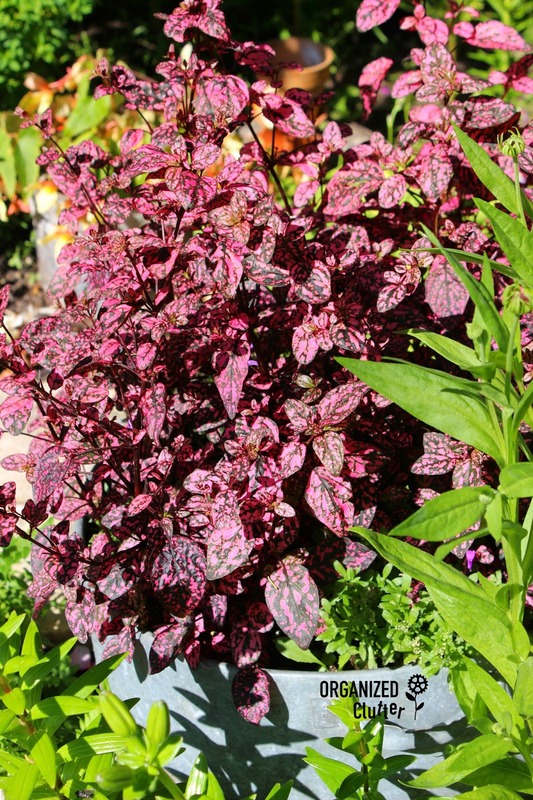 They have a semi-trailing habit, and I have used them in containers and in flower beds. Move over Coleus, this color leaved Polka Dot plant in my sister in law Kris's garden provides color and interest just as well as the better known Coleus. Also from my sister in law's garden, the showy dahlia. 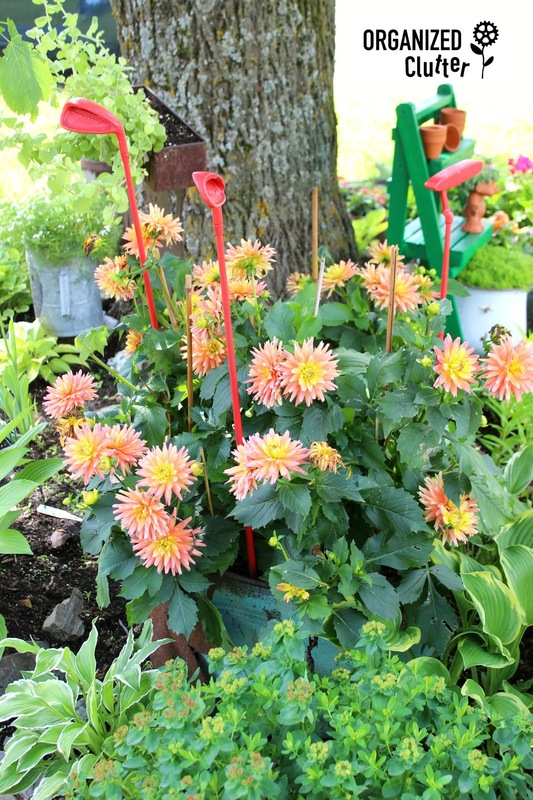 Dahlias come in many colors, shapes and sizes and can be planted in the garden or in a pot. You can dig up the tubers and overwinter them or grow them as annuals. This orange diascia annual occupies a galvanized container in my sister in law Kris's garden. I have some in my garden as well, but they are not this advanced yet. The diascia, a relative of the snapdragon, has become a welcome container annual in my garden of late. 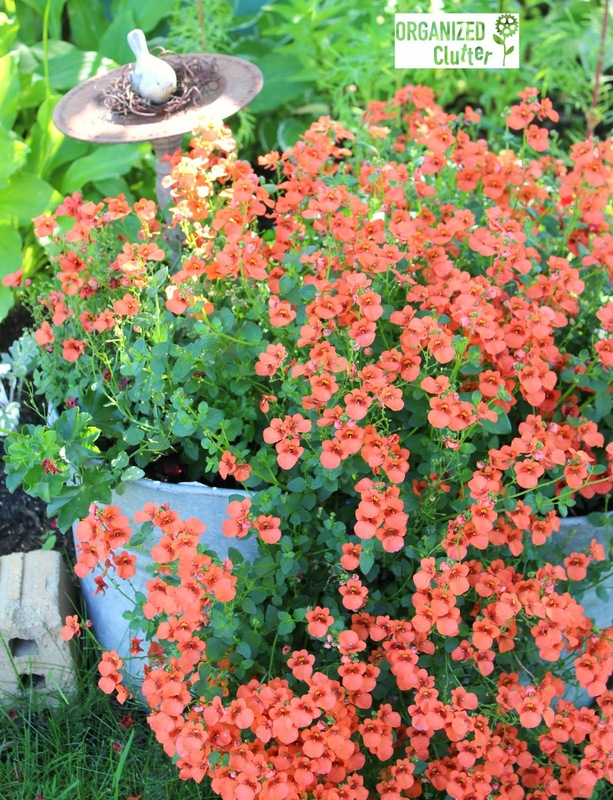 The red nemesia is a new go to plant for me! 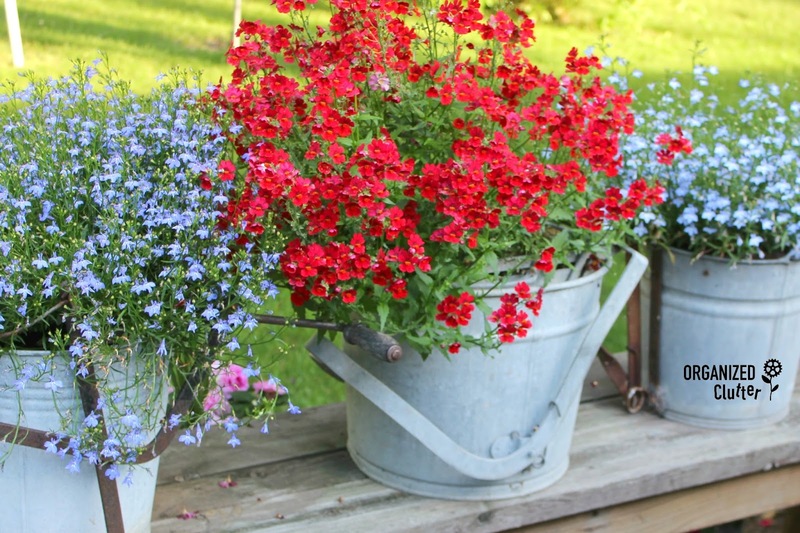 They look splendid in galvanized pails or mop buckets paired with heat tolerant lobelia. 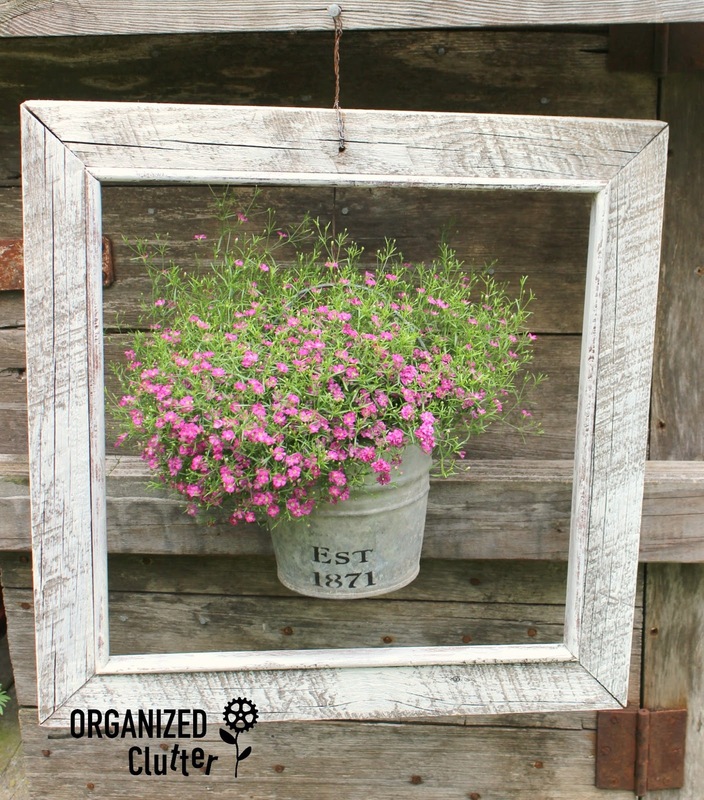 "I use about a quarter cap full of Miracle Gro to a 2 gallon watering can every time I water my annuals in pots. This is a tip I received many years ago from a greenhouse owner. She said "Most of the fertilizer leaks out of the holes so you can use weak fertilizer almost daily." If you use the powdered Miracle Grow use 1/2 spoonful to 2 gallon watering can." I have planted the Gold Dust Mercardonia in small pots with great results. Here it is in a small kitchen pot hanging on a pump. Gold Dust under a wire cloche! Gold Dust spilling out of a vintage lunchbox. The nasturium is a fast growing, long blooming annual that supposedly thrives on neglect. I don't neglect mine! They have a habit of spilling over onto neighboring plants and taking over the garden so planting them in a laundry tub under a wire basket (cloche) works well for me. My two pots of pink annual baby's breath this year are both turning out to be a success! I love the mounding habit and tons of little blossoms. These little bedding plants may be more difficult to find. The only greenhouse I found these in was a Canadian retailer. 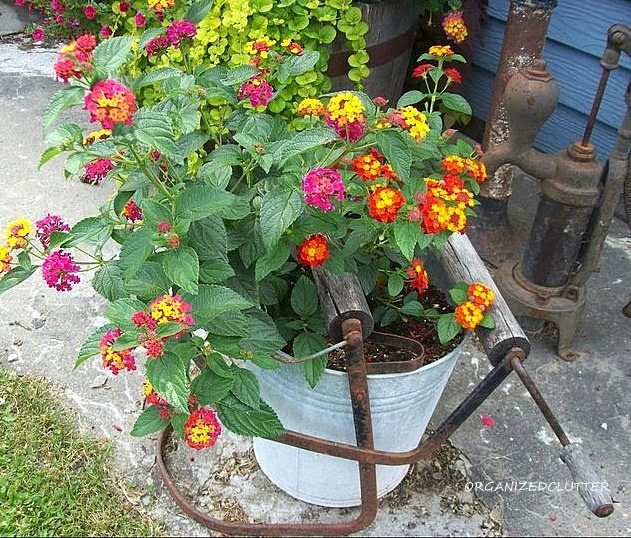 Perched on a garden stool are orange Lantana and Zinnias in a bucket. While I have planted lantana in pots for several years now, I am fairly new to zinnias. Lantana have a semi-trailing habit, and a fun yellow to pink or yellow to orange/red blossom. 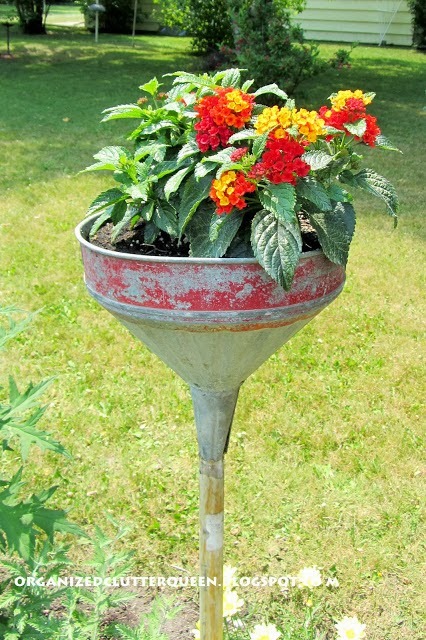 Lantana is my go-to annual for funnel planters. 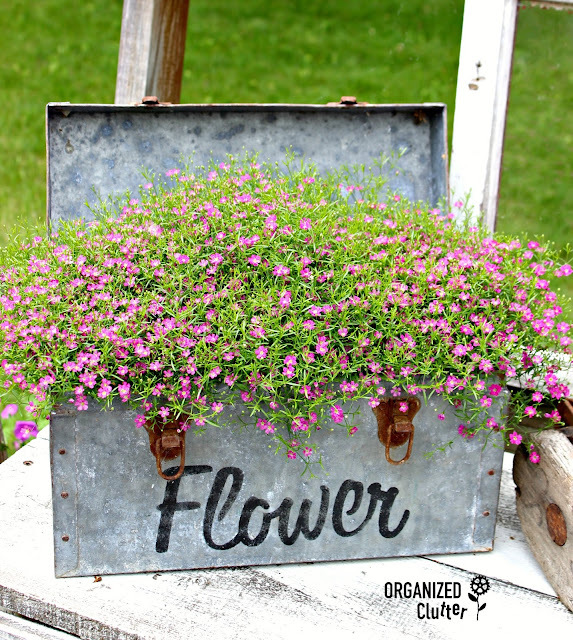 And of course they work in galvanized buckets too! This year and last, I planted some Benary giant zinnias in my front border, influenced by the Queen of the Zinnias, my sister in law Kris. She plants hundreds (maybe thousands) of zinnias in all colors, shapes and sizes, in containers and in flower beds like this one. Sun loving, heat loving zinnia in Kris's gardens. So when you grow tired of the same old, same old, give these under-loved annual beauties a try. Our local Home Hardware store has a large nursery and if you have similar type store you will find that in Spring and Summer mostly they get all the annuals coming in - new batches delivered each week. Our nursery sells them cheaper the more you buy. Works out sometimes at around $2 per plant. If you find out what day of the week your nursery gets their deliveries in, then be the first to pounce on those newly arriving annuals as they are unloaded. I scored a dozen Kalanchoe plants for $2 per plant whereas they usually cost around eleven dollars each plant. They had a limited number of these delivered and it is first in, best dressed. 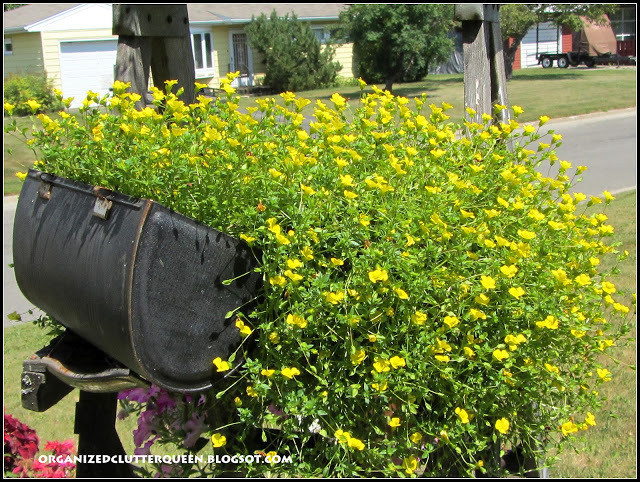 If you love to dress up your garden planters in annuals then make friends with the horticulturist at your local nursery and find out their delivery days. I also got 6 plants for free from our horticulturists home as I was looking for a specific plant and the nursery did not have it in stock. She was getting rid of some of hers (not annuals) to make space in her garden for a studio to be built and offered that I could come and dig them up and take them for free! How good is that! Beautiful! I have a new house so I hope to work in the yard this weekend. I know very little about planting. Is it too late to plant? You have a lot of fun going on in your garden. I love that red nemesia. 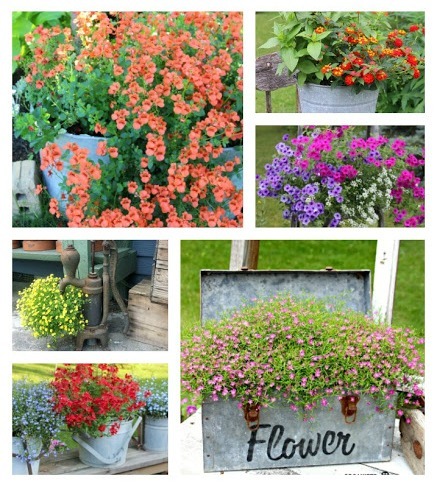 Focused more on perennials this year with the exception of some favorite cut flower annuals. Your yard looks wonderful. Thank you for the feeding hint, You're flowers always look so full and healthy. Thanks for sharing all of the plants, whether yours or your sister's they are are beautiful. I didn't plant as many as I would have liked to this year or used all of my 'junque' because I haven't been in the best of health, but I love seeing what others do.